This is a work-in-progress. I’ll be releasing updates every few days. I wanted to wait and release it in its entirety but I’ve had enough requests for it that I’ll be releasing as each part is tested. Media Center Valve or Valve for Windows Media Center (WMCVALVE) is licensed for personal non-commercial use only. Please do not redistribute the installer. It will only be available here at MissingRemote for a few weeks as I want to track usage and I will be making weekly updates. Media Center Valve is a work-in-progress of all my smaller Media Center Add-ins combined into one. Valve will replace Extender Live TV Startup, Control Panel, Start Menu Plus, Hide Menu Strips, AutoPlay Disable, Remote Remap, YAHAA and a few unpublished add-ins I use at home. I haven’t had time to test all the functionality so the version being release today will only allow you to set the default startup functionality. If you don’t need to change the startup functionality or don’t want to bother with updates later, please don’t install it. This works on the console, Windows 7 Embedded and on extenders with no delay. Download valve-setup-2.0.zip from the attachment below, you will need to be logged in to view it. Once the full version is released it will be available to download publicly. Run the appropriate version for your architecture or run install-valve.cmd if you are unsure. Run HideMenuStrips.exe (it is a standalone application) to configure the startup behavior. If you want to change extender profiles make sure to run as an administrator and change the user account via the drop down. In the next update I’ll include the MCML configuration application to allow you to config everything on the extender itself. Until the MCML configuration add-in is released later this week you will need to reboot, possibly twice, any Media Center Extenders after installing Media Center Valve for the startup functionality to work..
Like I mentioned, I’ll be making updates weekly, if not every few days, so if you have any requests please let me know below. I tried to download this and it threw out an error message when I tried to decompress. /sigh…some issue with IE8. If you have Firefox or Chrome please try that otherwise give me a few ~30 minutes to troubleshoot. Edit: If anyone is interested it is a bug in IE http://support.microsoft.com/kb/308090. IE9 does not have the bug. I’ll get a work-around in place tonight. I put a work-around in place (<3 .htaccess) that makes it work in IE. If you’ve previously tried to download you may need to clear your cache though. Thanks MW… sounds like a great app. looking forward to updates. Doesn’t look like anything happened. I installed th 32bit version and the only things in my E:Program FilesMikinhoValve folder is Valve.xml and Valve.png. That is all that goes there. Did you use the HideMediaCenterStrips app to configure it? No because I don’t know where to find that. Sorry, for some reason even though it said ‘stand alone application’ that it was part of the download. I’ll check it out. I probably should just include it in the install. I’ll do that for today’s update. I notice Valve comes with something like “Audio Device Selector”. I am interested in this as I switch audio devices whenever I want to turn on my surround sound. I currently use “Vista Audio Changer” which gives me a keyboard shortcut, but an interface in the 7MC UI to switch would be nice and I am assuming that is what this is. Per request I’ve added Netflix and Internet TV to the startup options. Note: I am not checking whether they are installed yet. I’ll add that but after RemoteRemap and Audio this week. How do I remove Valve? Any chance we can rename startup items? At some point Brian changed MyMovies to Movies. So now I have two movie items. I’d either like to see it renamed back to mymovies but it really should show up in the existing Movies menu group where Netflix resides. [/quote] Not that all programs can be renamed, but the option to rename My Movies is available in Binnerup’s latest version. Well, strange thing was it WASN’T in Programs & Features! I had to run the install again and tell it to remove it (this is the valve-setup-111024-0001.zip version). Am I missing something? I see HideMenuStrips & I’ve installed WMCValve, but I don’t see any of the other stuff mentioned. I looked in the extras library and saw an enttry called Valve Settings, but when I try to open it I just get the Blue media center background and nothing happens. I’d like to check out Remote Remap. I’ve been using autohotkey in conjunction with my iMon vfd and logitech remote to map buttons the way I want, but I’m curious to see whether this would allow me to perform similar tasks but with less headaches. Thank you for this utility. Thank you for this utility. This could very well sway the WAF in my favor. I finally heard “I hate this new setup, I don’t understand this menu” (Media Center Menu on the x280n extender). Having both extenders open right into Live TV was exactly what I was looking for this weekend. Mission accomplished. I have only been running the extenders for 3 days, so any little improvement will be much appreciated by her! Any update when you will finish the audio portion, i would like to be able to switch audio devices inside media player. Thanks for all your efforts in increasing the WAF for us HTPC guys. Any way to add the ‘nostartupanimation’ option to this for extenders? Sorry I missed this! Is this something you still want? If so, I can add it. Sorry it took me so long to reply, I never received an email from the system about your post. I actually figured out a way to accomplish this by modifying the registry, but it certainly would be easier if included as an option in MCValve. Thanks again for all your efforts. It definitely seems like WMC has lost its ‘audience’ as of late and it’s great to see guys like us keeping it alive. Thanks for the “Now Playing” entry point! The lack of a correct “Exit” button on my Harmony remote had been bothering me for some time. Your add-in and AutoHotKey made it all possible. 1) Harmony Remote: Map “Exit” button to “Windows Media Center SE” -> Alt+1. 4) Copy your script to your Startup folder so the script executes when logged in. I have installed the app and configured, however, the media extenders are starting wmc but I still see the basic menu, not live tv. Did you change per extender account? And did you start the Extender, wait ~30 seconds and then restart it? thanks it works fine now. Works fine now -great app. for some reason after installing the valve my computer doesnt wakeup from sleep anymore, thats when i use the mce remote with ir. after i unisntalled the valve it started working again? i would really like to use the now playing feature with my mce remote do you have any ideas ? Very odd! I’ll check in my code and see if I spot anything that could cause that. So when you say “doesn’t wakeup from sleep”. Is it only w/ the remote? Does it still wake using the power button on the chassis? yes it does wake up from the power button on the chassis and wol, its very odd!! My PC is having the occasional handshake issue. Any chance of being able to create an entry to run HDMION when the “green button” or “Start Media Center” button is pressed. Right now I have to fire up my XBOX and then come back to media center to trip the TV into seeing the PC and this only works about 75 percent of the time. Anyone had trouble with this with Intel onboard graphics on AMD Fusion setups? I am running a Gigabyte 785G board. FYI….I have been using your app for over a year now and it works great. Just wanted to let you know. Having problems with this in that it isn’t executing. Am using ver 1.4, per user with shutdown/strartup after each attempt. Select the devices user in the apps dropdown (at this point have 6 360’s) and apply “LiveTV” to the startup section of each- no go- sits on the initial screen. What I have got working just to make sure the app is communicating w/extenders is applying the netflix option to favorites. That does show up. What I am using now is the logon script method working suggested over on TGB, which is what I’m currently using, but unfortunately that method adds at least another 20+ seconds to startup. If I hit the red Live TV button when the first mce screen appears, it will nearly instantly go into Live TV. So the script method is apparently adding considerable overhead. It’s a mystery to me why this isn’t configurable in the mce interface itself. Alright, this is working now. The way it seemed to start working is in removing the app “Start Menu Plus” and reinstalling the valve app. I had a feeling something wasn’t going right when I initially ran the “Hide Media Center Menu Strips” apps and the users were greyed out. 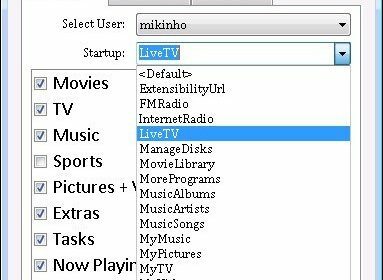 At any rate, thanks to the author- mikinho- this has been a great app in the past with organizing my media strips, and now superb in starting Live TV immediately giving my migration from directv’s instant on receivers to media center via xbox, excellent acceptance. Also, anyone using the logon script method for startup to live tv needs to switchover to this app as it is MUCH faster! Hi. I have been using your wonderful software since it came out. It has worked perfectly to boot my xbox extenders straight to live tv. However, I added a new xbox recently to my setup and I cannot get this new xbox to boot into live tv. I have tried uninstalling and then reinstalling your program but it still doesn’t work. All the old ones boot to live tv perfectly but not the new one. Is there any updates to media center that would have caused the program to not work anymore? Thanks in advance for your reply and for creating the single most useful program I have for my HTPC setup. Is there a way to auto start MediaBrowser? It seems that this software isn’t being actively supported but I wanted to let you know I have been unable to get it working. 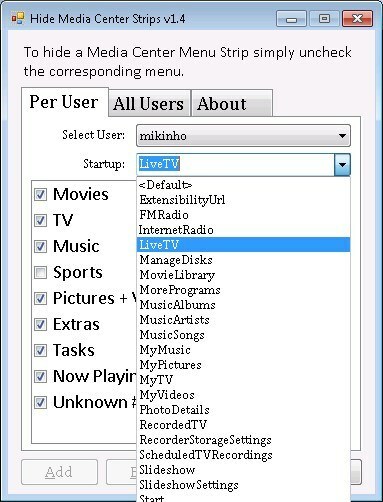 Even setting the local account up this way doesn’t make Media Center open to LiveTV on the PC itself. Same as millerduck, no luck so far. I installed this, but found it’s nearly useless as is. The link I got said it could replace Windows Media Studio. But all it does is control startup. Furthermore, the installer failed to copy the DLL.